Health systems broaden their importance in the midst of the ongoing international communications revolution. 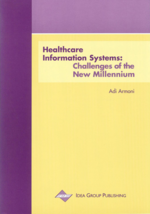 Health services are a natural candidate to become an integral part of the “information highway”. Terms such as telemedicine, telehealth, teleradiology, and teledermatology have been integrated into technical and academic jargon and have become the object of research and organizational planning. Telemedicine is the utilization of electronic technology to send medical data from one location to another. Supporting technology may be anything from a simple telephone, to complex communication satellite, and modern, videoconference equipment. The term telemedicine is used to define the practice of medicine through communication technology. These two ancient words, medicine and communication, were first linked at the beginning of the 20th century, when ships used radio communication to receive medical assistance. It was only in the early 1960s, however, that link became truly significant. When we discuss communication from the technological aspect, we refer to the means permitting widespread transfer of information.